As the colder weather sets in and Christmas approaches, I find my thoughts returning to the warm, sunny days of Summer. One of my most enjoyable activities this Summer was introducing my 3-year-old granddaughter, Milly, to the delights of using plants for colour and this proved very popular. 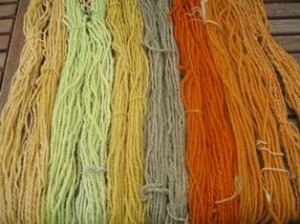 As I wanted to avoid any confusion between “dyeing” and “dying”, I decided to call our experiments “making colours for white wool”. 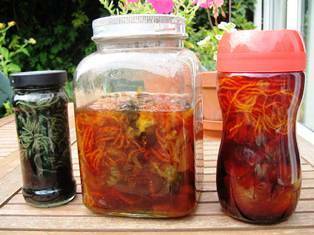 We collected onion skins, dyer’s broom tops, dyer’s chamomile flowers, dahlia flowers and marigolds (Calendula) and we also used some of the frozen viola petals (as used for the ice-flower experiments described in an earlier post). We put these into glass jars, together with a skein of alum-mordanted wool and we added an iron spike to the jar with the marigold flowers. These jars were then left in the sun and Milly regularly checked the progress of the colour on the skeins each time she visited us. 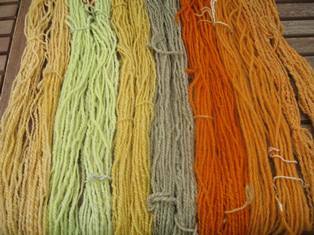 When she was satisfied with the colour on each skein, she pronounced the experiment finished and we then rinsed, washed and dried the skeins. She now has a small sample of each colour in her own personal scrapbook. I am looking forward to introducing Milly to more dyeing experiments next Summer, when the weather is warm enough for working outside.